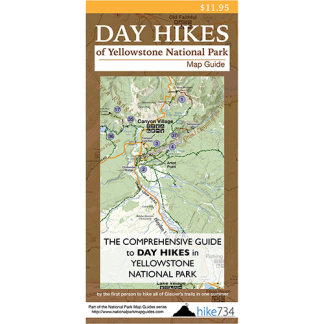 This trail follows the south rim of the dramatic Grand Canyon of the Yellowstone River giving amazing views of its colorful walls and powerful falls. The trail starts at the south side of the Chittenden Bridge where it follows the river downstream. The river rolls and churns as it approaches the drop into the canyon. Numerous large rock formations create tall mini-islands with an old bridge as a backdrop. The trail weaves its way along the forest, but never far from the river with great overlooks. The river disappears around a corner at the brink of Upper Falls. The trail breaks away from the river, only to come back with a front row view of these fantastic falls. The trail then heads up into the trees and towards a parking lot. Here is another overlook of Upper Falls. The trail continues in the trees. A junction for Uncle Tom’s Trail heads off to the left. This trail turns to a steep staircase descending 350ft/105m to a breathtaking, up close view of Lower Falls adding 0.4mi/0.6km extra to your trip. The trail continues on through the trees giving great, intermittent views of the canyon, the falls, and the crazy rock formations. Always be careful of your footing and stay away from the edge as a mistake could be fatal. More overlooks and some walking through the trees takes you to the parking lot of the famous Artist Point. This classic view of Lower Falls is very busy, but worth a stop. Beyond this point, the crowds are smaller as the trail continues at the Ribbon Lake trailhead. 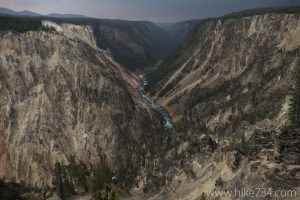 This dirt trail runs along the canyon rim with the ever changing views of the canyon and the Yellowstone River far below. The walls are red, white, yellow, and every color in between. Rock spires add to this surreal landscape while the Yellowstone River continues its whitewater fury. A few more great overlooks dot the trail until it terminates at an underwhelming point surrounded by tall trees with limited views called Point Sublime. Turn around here. To turn this into a loop, follow the Clear Lake – Ribbon Lake Trail and Wapiti Lake Trail back to the Wapiti Lake trailhead. This route is 0.9mi/1.4km shorter. Trailhead: Park at the signed parking lot for Wapiti Lake on the South Rim Drive, just east of Chittenden Bridge located south of Canyon Village. Follow the paved path that begins at the northwest corner of the parking lot, down to the bridge to the signed South Rim Trail trailhead.